I was looking through some old pictures and I found a few of the cars that I owned shortly after I started driving. The pics brought back a lot of great memories. My first car was one my parents purchased just before I started driving, in 1985. It was the first time our family had three vehicles at the same time (other than a motor home), and it was bought in anticipation of us needing a third car for me to drive, as well as saving some mileage on the family conversion van. I remember when we found it on the used car lot. It jumped out at us. We were at Ritter Nissan in Waldorf, MD, and the car we found was an Oldsmobile. We always bought Oldsmobiles. This one was a 1981 Olds Omega. It was painted 2-tone white on gray, with a pair of bright red & orange stripes down each side, along with "sportOmega" in big white letters on both doors. In hindsight, the car really was kind of an eyesore, but it stood out that day and we bought it after a quick test drive. It ended up being the car that I used to learn how to drive, and I drove it until the summer after I graduated from high school. I loved it, not just because it stood out of the crowd, but it was fun to drive, too. It had a V6 engine, a sunroof, and was loaded with power windows & locks and a cassette player. The car had its issues, though, and was in the repair shop a lot. It wasn't very reliable. In fact, when I had a flat tire, I discovered that the wheel was rusted to the car. My SportOmega began to be a liability, and it became clear, with college starting in the Fall and my needing reliable transportation to commute to the University of Maryland in College Park, it was time to find a new car. My second car was not nearly as exciting, but it was more refined than what I was used to. And a lot bigger! 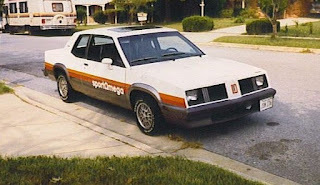 It was a pretty 1985 Oldsmobile Cutlass Supreme. It had beautiful burgundy paint, cloth velour seats, wire wheels, and screamed middle age. The Cutlass was a nice car, don't get me wrong. I have always loved the Cutlass's. But with the set-up this car had, it was more like what an older family man would be driving, not what a college student should have. Dad finally agreed that we could fix it up a little, which meant getting chrome mag wheels with lettered tires. The engine was a V6, which was good for gas mileage, but it didn't have a lot of get-up-and-go. But it looked great with the new wheels and tires. I drove it all through college, and when I started my government career, we decided I needed to get something a little nicer. And a nice car it was! Dad and I saw an ad in the newspaper for a 1987 Olds 442. The 442s were the same as the Cutlass, but with a much more powerful engine, a V8 307, fancy 2-tone paint job and chrome wheels, dual exhaust with an aggressive throaty roar, removable glass-panel T-tops, and definitely a step up from the Cutlass that I had. We bought it on the spot, trading in the '85 Cutlass, and I excitedly drove home in my first muscle car. It was a great car...for a few weeks. Then I started having problems with it. It was just one issue after another, including a bad electrical problem that took over a year to fix. As much as I loved that car, and it was a nice looking car, I sold it just over 2 years later because it had so many problems. A lady bought it from me for her teenage daughter, who promptly wrecked it several months later. I don't think you ever forget your first car(s), and I sure loved mine.